Toraya centers the Japanese universe in Arlington. Here, small is beautiful with 18 seats and five at the bar. We're here for lunch early but you can't be late because by 11:30 it's full. The line is growing, it's right before Christmas but still. 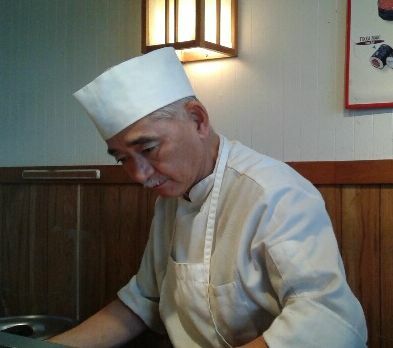 Shinji Muraki, owner and chef, is calm. I, on the other hand, panic seeing people waiting but no, he's doing it all, as in just him with one server, Hitomi. I've eaten here many times and as with most things, you have to kiss a lot of frogs. I'm here with Lim, who opened his first restaurant in Waltham a long time ago, and knows Shinji 20 years. He eats here often and when he says we need to leave Brookline now, you do it. He's right and it's worth it. With no assistants, Shinji must have started working the fish hours ago. 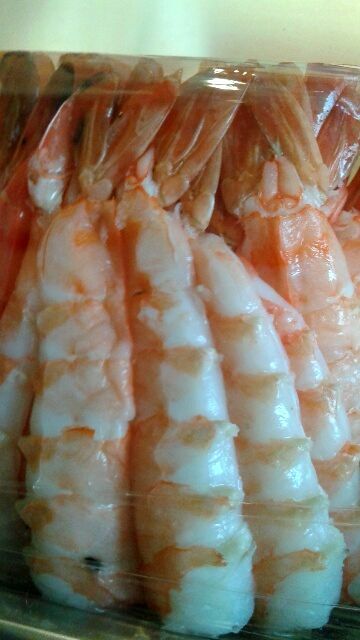 Shrimp are peeled and lined up like good soldiers. 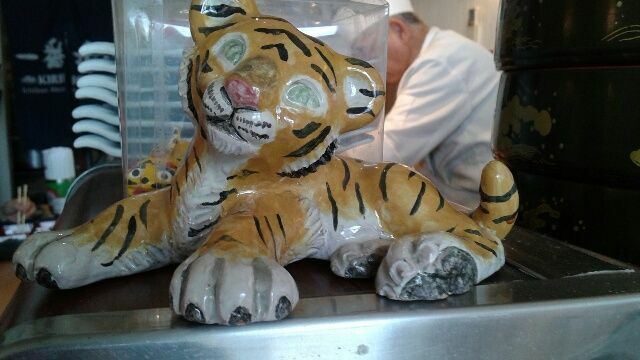 Nearby is one of the tigers, a motif. Tigers don't go for shrimp, right? At the bar, Lim makes a friend, an American who's widely traveled. The new friend, in an orange hat who hails from New Haven and mentions Frank Pepe as if he were Harvard, I wasn't introduced, is guessing where Lim is from. He's nearly right and soon they're comparing places to eat in Hong Kong, Cambodia and Vietnam. They trade stories, more than I have ever heard from him and we know each other years, and finally they're back to Boston agreeing this is a liveable city so long as you know where to live and where to eat. Not surprising both of them have eaten in the same place at 5 am in Hong Kong but not at the same time, of course. 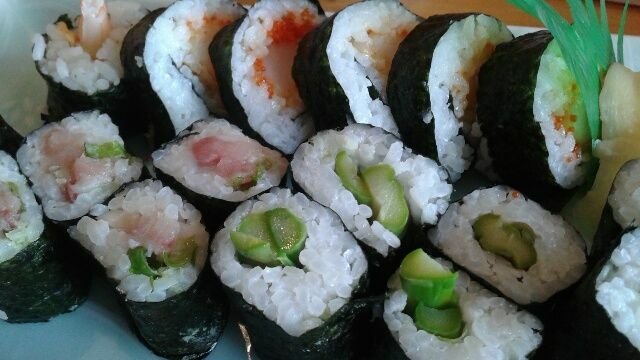 The purist takes the usual route with asparagus maki, yellowtail with scallion, and tempura shrimp maki. Yes, I thought it was usual and I am wrong. Bright crunchy spears with immaculately seasoned rice needs no soy and no wasabi. Yellowtail, rich and meaty, one of several varieties including yellowtail flounder, yellowtail snapper, yellowtail horse mackerel, please no, or Japanese amberjack. So it could be almost anything. It's excellent and is it because it's right off the boat, or it's not cold, or is it the rice or the seaweed? The shrimp tempura's still warm with a touch of chili sauce. I don't know how he does it: one chef with one server. The more sushi I have, the more I discover each chef's specialty. Not a bad research project and luckily our grant's extended for another year. But the pièce de résistance today is yours for .95 and it's chirashi, modestly listed as an "assortment of fresh fish, egg and vegetables placed on top of sushi rice." (No egg on my fish, nor my hamburger and I don't see any here.) It is by any standards a beautiful bowl. 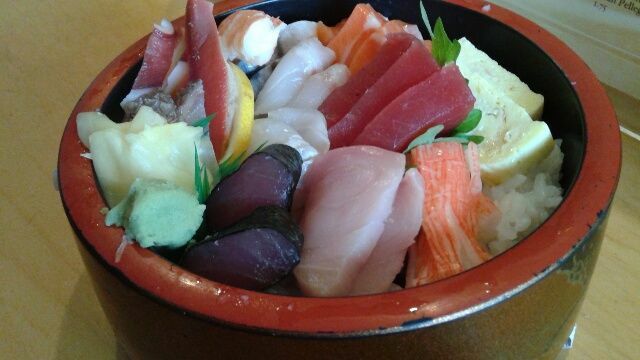 The last time I saw chirashi, or chirashizushi, was in San Diego where everyone was having it for lunch. Chirashi means "scattered" so what you get depends on where you are. When the bowl is set before the person who orders it, do not expect to be offered a bite or a piece. I didn't and it wasn't. The same bowl of chirashi, I am assured, costs in Tokyo. Toraya chirashi has tuna, shrimp, octopus, white fish, clam, salmon, crab roll and whatever else is right off the boat. Now I am debating: do I share this story since it means we're all going to have to wait longer? Authentic, especially in the neighborhood, always comes with a price and why is it so far away? I need a drink. There's sake cold: ozeki dry, hakushika junmai ginjo, kaguyahime,kira, kaori, kimoto and others. Sake hot: house. There's Sapporo, the original, and Kirin Ichiban (meaning number one) plus three whites ( a pinot, a chardonnay and a sauvignon) and three reds that include plum wine. It was lunch, we didn't drink. No raw fish, you say? No worries, there are tempuras, agemono of pork, chicken and salmon, and teryaki for all plus udon, salmon okabe, wafu steak, and other fried specials. Months ago, on a research project, I read about a Japanese place in Manhattan that ends its sushi dinners with pie, much to everyone's surprise. I think about pie. Pie would be a fine finish, something about the fruit and rice, and if it could be peach pie, though it's winter, so much the better. (I mentioned this to a sushi chef in Cambridge. No answer.) Oh, well, go home and make your own pie. 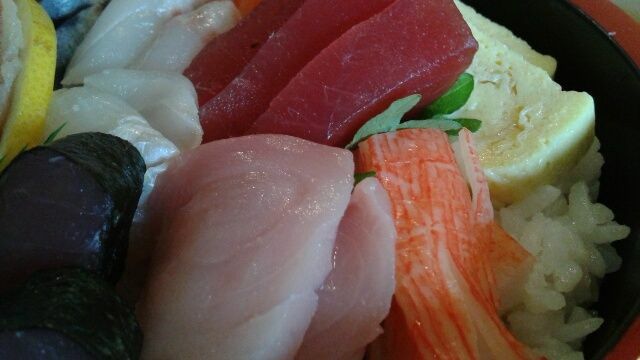 As for take-out, though it would be nice to have all this in one's dining room, it may work better to just have it here since the best time for fish is as it falls from the knife (this from the San Diego sushi chef). © February 19, 2016 See more at Corporate Edge and on Twitter.